Sence Copenhagen is the exclusive Danish designer jewellery brand from Scandinavia that is at the forefront of the latest trends and designs. 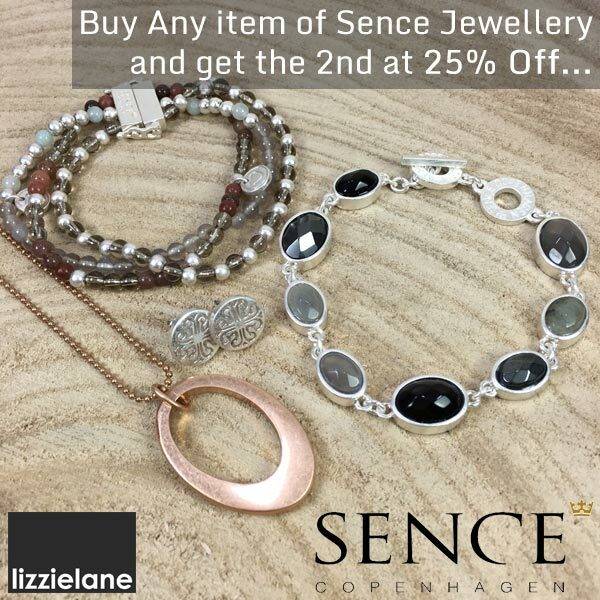 Buy any item of Sence Jewellery and get a 2nd at 25% Off! Sence happens to be one of our favourite brands – not only because all of their designs are unique, but also because they are all lovingly hand-made by skilled craftsmen for the woman who truly appreciates the world and its beauty. Discover new experiences, with unique necklaces, bracelets, earrings, bold chunky rings and charms from their latest collection as well as the timeless classics from their Signature Collection. Simply add the items to your cart and you’ll see the discount when you checkout – But be quick, our exclusive Sence Copenhagen offer ends midnight Monday 5th December…And don’t forget – Free UK Delivery on all orders, delivered in-time for Xmas! This offer is only applicable on all Sence Copenhagen items. Promotional offer applies only to qualifying items displayed here. Items that are not displayed within this category do not qualify for the offer, regardless of the nature of the item. In order to qualify for this promotional offer, the products must be purchased within one order. The 25% discount will be applied automatically to the lowest priced qualifying product, and will be shown on your shopping cart and order confirmation page. The discount cannot be used in conjunction with any other offer. There is no limit as to how many times this promotion can be used, however this offer is subject to availability, and Lizzielane Jewellery reserve the right to amend or terminate the offer at any time, but in any event the offer expires no later than midnight Monday 5th Dec 2016. Offer has no cash alternative. E & O.E.